On this page you'll find answers to all the Disney’s Magical Express frequently asked questions we receive. Disney’s Magical Express is a service that provides free bus transportation to and from Orlando International Airport and Disney’s resort hotels, for guests staying at those hotels. While the word “FREE” always sounds good, there may be some situations where using Magical Express does not make sense. 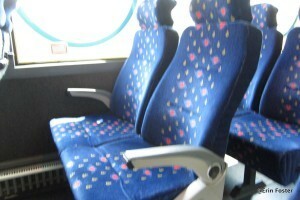 There are also some tips and tricks that can make your Magical Express experience better if you do choose to use it. Here’s what you need to know. Sign up for Magical Express when you make your room reservation. Sorry, no. While the Swan, Dolphin, Shades of Green, and a few Disney Springs area hotels are quite close to the action, only guests staying at the hotels actually owned by Disney qualify for free Magical Express transportation. If you’re considering staying at the Swan/Dolphin/etc., you may want to factor the lack of Magical Express service into your decision process. The lack of ME means that staying at these resorts will automatically add a rental car fee or cab/shuttle/Uber fare to the cost of your vacation. 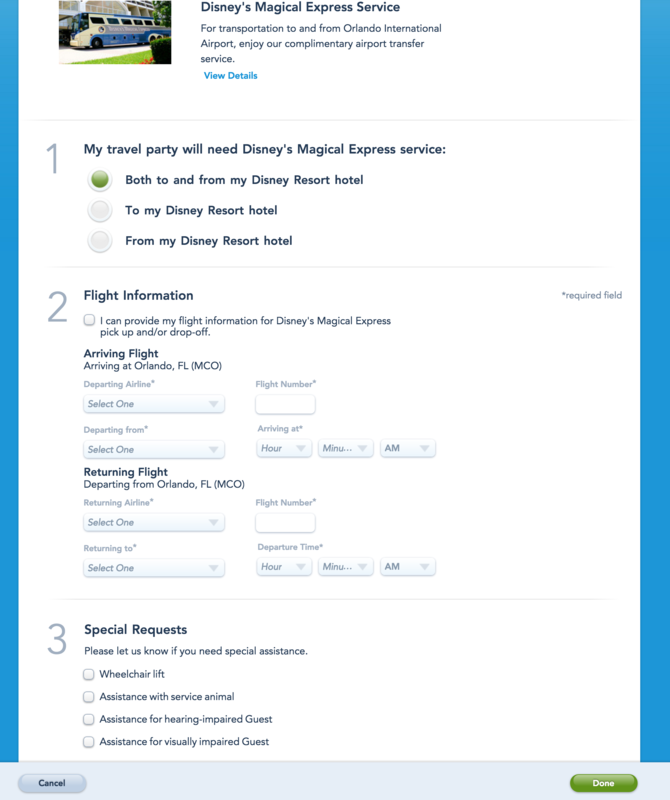 When you make your Disney hotel reservation, you will be asked if you want to use Magic Express. You’ll find it in the booking check-out process. Look for the words "Magical Express" or "Add Ground." If you click “Add Ground” the next screen will ask you whether you want Magical Express from MCO to your hotel, from your hotel, or both ways. If, for example, you were going from the airport to WDW for a few days, and then to a Disney cruise, you might be going from the port terminal to MCO rather than from WDW to MCO. 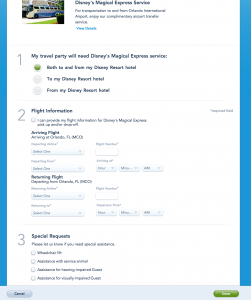 In this example, you’d choose just the “To My Disney Resort Hotel” option. 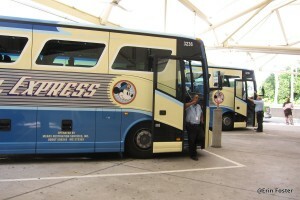 Magical Express can be arranged at any point prior to your trip by visiting the WDW website Airport Transportation Page or by calling 866-599-0951 or 407-939-1936 in the United States and Canada. 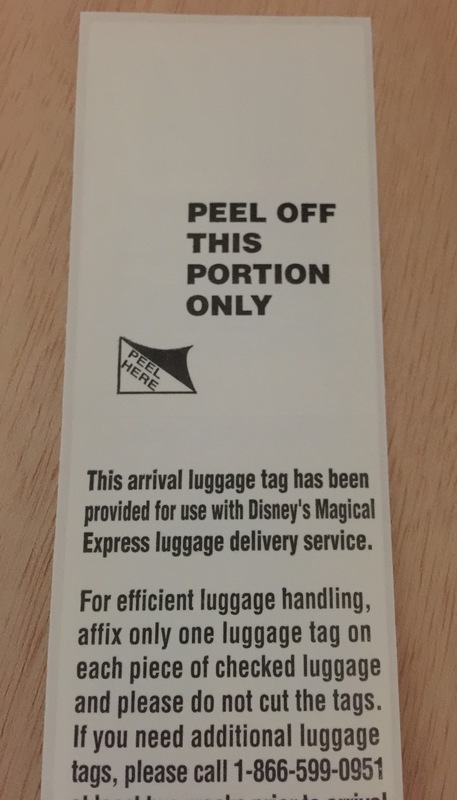 You should, however, be aware that in order to have Magical Express luggage tags mailed to you, you’ll need to make your ME reservation at least two weeks in advance. Yes. As long as you have a reservation at a Disney hotel on the list above, then you can use ME. Call 866-599-0951 to set this up. Have your resort confirmation number and flight information available when you call. 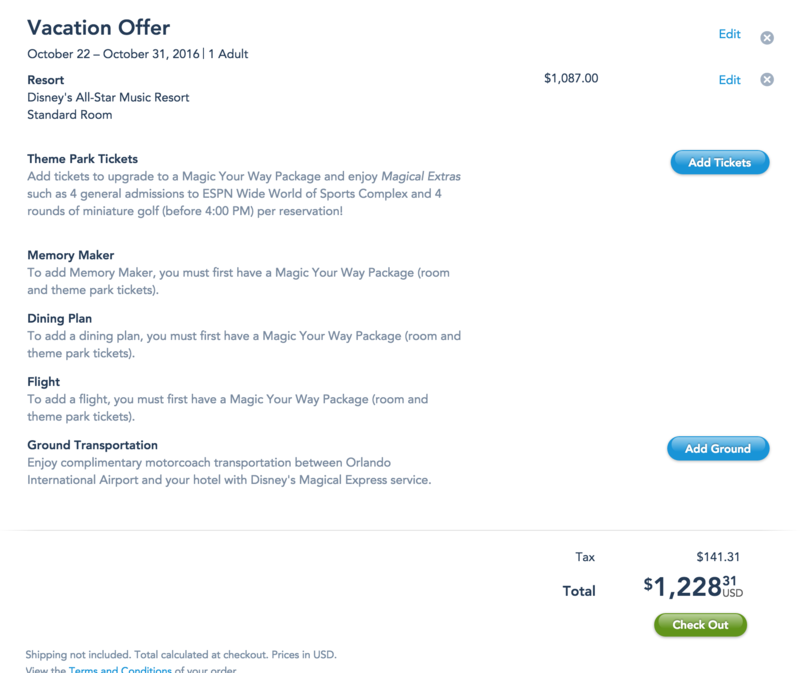 Please note that sometimes the Disney hotel reservation number and your Orbitz/Expedia/Travelocity/etc. confirmation number are not the same. 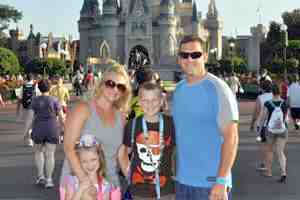 You may need to contact your sales agent to get the correct Disney reservation number. Most guests will use their MagicBands as their “ticket” for the MagicalExpress bus. Note: Some Canadian residents will encounter procedures similar to those of U.S. residents. Some non-US guests may get paper vouchers for MagicalExpress. The luggage tags are paper and look much like an airline bag tag, but yellow. They are the tracking mechanism Disney uses to send your luggage directly from Orlando International Airport to your Walt Disney World hotel. MagicBands have many functions (see above link for more info). In this situation, they function as your Magical Express ticket. When you arrive at the Magical Express area at the airport, they will scan your MagicBand and point you to the correct bus waiting area. 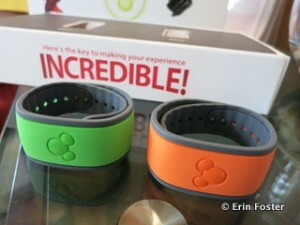 Remember to wear your MagicBand or to keep it in your hand luggage. 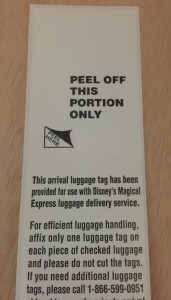 Don’t pack it luggage that’s tagged to go to WDW without you. 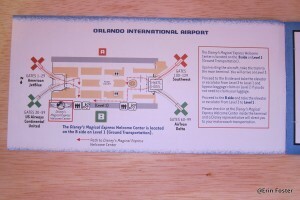 MagicalExpress help desk at MCO. Disney states that bags are typically delivered in three hours. This is often interpreted by guests to mean “three hours after your plane lands at MCO,” leaving Magical Express users frustrated by lack of access to their luggage. However, the real scoop is that bags are supposed to be delivered within three hours after you check in at the hotel. In reality it may take even longer than that for your bags to make their way to your room. Anecdotal evidence suggests that waits of up to five hours after resort arrival are not atypical. If you’re adults arriving in the morning and heading straight to the parks, you might not even notice this time lag. If you’re arriving at night with small children, not having access to your luggage could be a minor disaster.Thus, if you plan to have Disney deliver your bags to your room, you should be sure to stock your carry-on items with anything you might need for the better part of day. This may mean a change of clothes, toiletries, and baby gear. You should always keep medications, electronics, and trip documentation (including MagicBands) with you in your carry-ons. Unpeel just the top 3 inches of protective paper. (See photo where it says “Peel Off This Portion Only,” that’s the bit you want to remove from the adhesive.) Do this on both ends, so you have a small exposed adhesive rectangle on both ends with a long strip in the middle still covered with paper. Also, having Disney deliver your bags saves you quite a bit of shlepping. You don’t have to maneuver luggage through crowded terminals or hotel lobbies yourself, someone behind the scenes is doing this for you. If you’ve got young kids and are trying to push a stroller in addition to carting luggage, or if you’ve got medical issues or mobility problems, using the Magical Express luggage delivery service can be a real lifesaver. Luggage tag back. Only peel off the small rectangle of paper at each end of the tag. I’ve decided I’d rather not wait for Disney to deliver my bags. What do I do? Once you’ve grabbed your bags yourself from the luggage carousel at baggage claim, wheel them with you over to the Magical Express check-in area. Honestly, the easiest thing is for you to retrieve your bags at the airport yourself and bring them with you to the Magical Express bus. 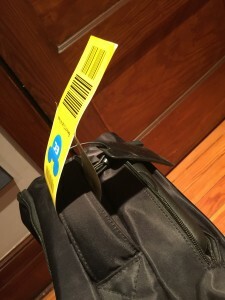 The WDW website states that you can just leave your bags, go to the ME desk and describe your bags and give them the baggage claim code from your airline, and they’ll find them and bring them to the hotel for you. I’ve heard it works, but the entire concept just makes me nervous. Slip the tag through the handle of your suitcase. Stick the two adhesive rectangles together, making a circle around the bag handle. An exception to this may be the subset of Canadian guests flying from the major Canadian airports which offer U.S. Customs pre-screening. These guests may encounter the same processes as U.S. guests. If you have specific questions, call Disney directly. There is no charge to have Disney deliver your luggage to the hotel. 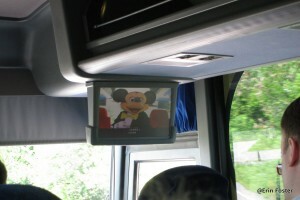 Having Disney deliver your luggage will probably save you a few dollars over bringing you bags onto the bus yourself. If you’ve read our post on Disney Tipping Norms, you’ll know that you should tip a few dollars to anyone who assists you with handling your luggage in your presence. It’s a near certainty that your bus driver will help with putting your bags under the bus and getting them out, so you’ll want to tip him. Strangely you may actually save a few bucks if you let Disney provide the service to you of delivering your bags to your room directly, since it’s quite possible that you won’t be in your room when you bags arrive, thus you won’t have anyone to tip. The Magical Express buses run 24 hours a day. Whatever time you arrive at MCO, there will be a bus to take you to your hotel. This applies to flights that are running on time and to those that arrive late due to weather or other delays. Step up to any of the Magical Express podiums. If you have your MagicBand, you’ll scan it at the podium and a cast member will direct you to the proper queue for the bus to your resort. Every member of your party over the age of two will have their MagicBand scanned at the podium; have them all ready before you approach. If you don’t have a MagicBand, have your resort confirmation number ready. The cast member at the podium will look up your reservation and issue you a paper voucher for the bus. Just give whatever bags you have, checked or large carry-on, to the driver, and he’ll load them under the bus for you. Yes, most Magical Express buses do have a small lavatory at the rear of the vehicle. It's not luxe, but it works in an emergency. I want to rent a car for my trip, but I’d like to save time by having Disney deliver my bags to my room. Can I do this? Really? I can't send my luggage with Disney and take an Uber to the park myself? Well, OK, there is a complicated workaround that some families use. I've done it myself once. 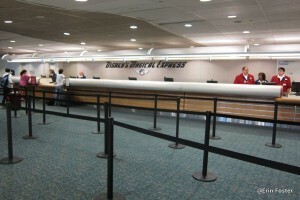 In order to accept luggage for delivery, Disney requires that at least one person staying at WDW ride Magical Express. It does not require that everyone in the room ride ME. This means, for example, if you're a party of five (all in one room), you could have one person ride ME to their WDW hotel, with Disney moving the luggage of all five people, and the other four party members taking a cab/Uber/rental to WDW. Um, why would we do this? Two reasons. First, splitting up the way your party gets to WDW allows some folks to get to theme parks earlier. One person takes one for the team and gets everything set up at the hotel while the others go directly to start playing in the parks. Another reason to split up is to allow your party to get a smaller, less expensive, rental car. A family of five might be OK with squeezing into a compact car for quick trips around the WDW campus. However, those five people might have too much luggage to fit into a compact car. If one person takes ME, then Disney carts the bags, obviating the need for a larger vehicle. Nope. They’ll only drop you at your resort. If you want to go directly from the airport to a theme park, you should rent a car or take a cab, car service, or Uber. There’s an introductory video shown on the bus. You could also just show up at the Magical Express desk and ask for a ride. I’ve done this myself four of five times for various reasons. As long as you have a valid Disney resort reservation number, they’ll transport you. 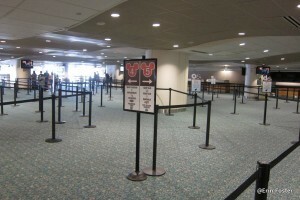 It’s better if you can make reservations for your trip from MCO to WDW, but it’s really not a disaster if you forget. As long as you have a WDW hotel reservation, they get you there from the airport. But don’t expect to do this for your return from WDW to MCO. If you don’t have a Magical Express reservation in that direction, the bus won’t even know to pick you up. You must make a reservation to get back to the airport. We've also heard of guests using Magical Express when they just need to get to Orlando International for a few hours during their trip. The most frequent instance of this is someone needing to collect a minor child arriving at MCO on a different day than the rest of their family. If you're in this type of situation, call Magical Express and they will very likely help you arrange transportation. That seems like a long time. Would it be any faster if I rented a car or took a cab? On the other hand, Magical Express is free. There are costs associated with other forms of transportation. We’ve generally heard of Ubers in the $35 and up range each way. Cabs and car services are typically $50 and up each way. Rates may depend on the size of the vehicle you need, the number of people in your party, holiday or weather surge pricing, and other factors. Again, Magical Express is free. Other forms of transportation are not. I know my hotel is the last stop on my Magical Express loop. Any way to speed things up? We have one enterprising reader suggest that you take Magical Express in order to get them to transport your luggage, but that you get off the bus at whatever the first hotel stop is, regardless of whether its your hotel. From that first stop you can grab transportation to the theme parks and get started on your touring a few minutes earlier. This is a commando move that only works if you have the bare minimum of carry-on items (nothing under the bus, for example) that you can comfortably bring with you into the parks. It's the rare theme park warrior that will want to do this. If you ask 10 people, you’re going to get 10 completely different answers about this. I used to be VERY anti car rental. Now I’m more in the “it depends on where you’re staying” camp. If you’re staying at the Grand Floridian and will be spending most of your time at the Magic Kingdom and Epcot, you won’t need a car. If you’re staying at a Saratoga Springs treehouse and you’ve got small kids, you’ll almost certainly be more comfortable with your own vehicle. Well, there didn’t used to be. But in early 2018 Disney began charging resort guests a fairly substantial daily parking fee. This applies if you’re driving to WDW from home with your own car, or if you’re renting a car in Florida. Ugh. This makes using Magical Express and skipping the airport car rental even more appealing now. Magical Express signage at the airport is plentiful. Disney has occasionally tinkered with the timing of Magical Express pickups. At one point when there was some major construction happening at Orlando International, ME pickup for domestic flights was four hours in advance. Always double check. I want to get in the most park time possible. 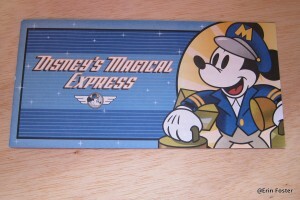 Can Magical Express pick me up at a theme park for my return home? Yes! Yes! Yes! This is wonderful service. I’ve used it many times myself without a hitch. 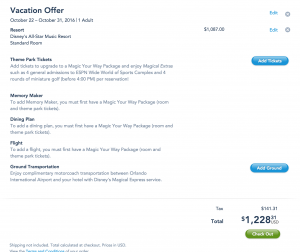 You don’t even have to be using Magical Express to take advantage of Resort Airline Check-In. Even if you’re driving, this is a way to get your bags to the airport without you having to carry them. RAC will even print you out a boarding pass. This allows you to proceed directly to your gate. Yay! Not every airline participates in this service. Currently the approved airlines are: Alaska Airlines, American Airlines, Delta, JetBlue, Southwest, and United. This list changes with some regularity. You may want to stop by early during your visit to confirm that your airline participates. Yes, RAC is generally open from 5:00 a.m. until noon. (Note that this is a time change, previously RAC had been open until 1:00 p.m.) Bags must be dropped at RAC no earlier than 12 hours prior to your flight and no later than 4 hours prior to your flight. This means that guests booked on flights departing prior to 8:00 a.m. may not use Resort Airline Check-In. There’s a Magical Express pick up spot just outside the lobby of every Disney-owned hotel. But once you’re at WDW without a car, it's likely that you will be at least a bit at the mercy of the internal Disney transportation system, which has many pros and cons of its own to consider. You could also rent a car for just a day or two mid-trip. 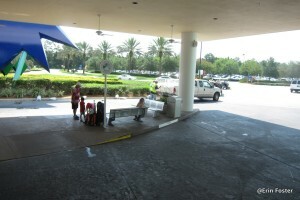 There are Avis and National car rental desks at the Dolphin hotel (an easy walk from Epcot and Disney’s Hollywood Studios) and the Disney Car Center (near the Magic Kingdom, accessible via shuttle from most area hotels), as well as other rental company desks at some the Disney Springs area hotels. But again, you'll obviously be spending money if you're renting a car.